Saint-Cernin du Causse is a picturesque and quiet village of historic Quercy. It enjoys an amazing geographical situation, right in the heart of the Parc Régional Naturel des Causses du Quercy, hence its name. It’s indeed a stone’s throw from the major tourist Quercy landmarks such as Rocamadour and Padirac Chasm (40kms); Figeac (48kms); Saint-Cirq-Lapopie (34kms); Cahors (28kms) and Cabrerets in the Célé Valley (20kms) to name a few. This turns it into an ideal spot for tourists; they’re indeed at driving distance from these sites, yet can enjoy the quiet and peace of a rural village, away from the crowds. Many foreigners (English in particular) are very fond of this little corner of France; they bought and restored old village houses over the years and reintroduced some life to the village. The increase in ‘inhabitants” (even if most foreign owners come only during the holiday season) led to the revamp of the church. The church of Saint-Cernin du Causse was built in 1846 and enlarged in 1870; it doesn’t look anything special from the outside, just a simple, plain, musty and dusty village church. However, its interior is amazing, as it is a successful blend of colours and styles. 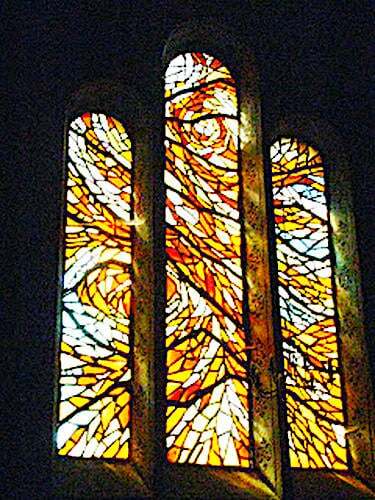 It indeed boasts a wealth of contemporary stained glass windows that project their vivid colours on the equally colourful frescoes of the walls and pillars. The nave and the side chapels are skillfully painted and showcase a polychrome statue of Christ with blessing hands. 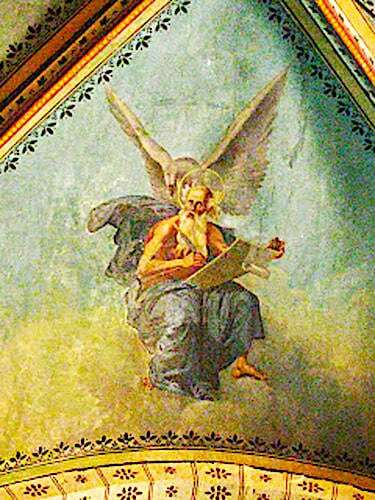 A stunning (and recently restored) fresco painted in the late 1800s by the local artist Henri Petit adorns the nave’s vaulted ceiling. The other unusual feature is the bell, which dates from 1303; was it recovered from a previous church or brought back from another? Nobody really knows. You never know what you might find when you climb old stone steps and push open the ancient wooden door of a village church in France!